The Monoball p0 Hybrid Ball Head Flip Lock Quick Release from Arca-Swiss has a unique design that combines the light weight and straight-forward simplicity of the original p0 head with the geared precision movements of the C1 Cube. The p0 Hybrid employs an aspheric ball with 3-point locking that enables smooth adjustments and secure lockdown, allowing the 1.1 lb support to handle loads up to 44 lb. The photographer or videographer first makes coarse leveling and alignment adjustments, locks them down, and makes fine adjustments of plus or minus 10 degrees on the x and y axis using the head's 2 self-locking geared segments. You can then use the swivel stage above the geared sections for a completely level 360-degree rotation without further adjustments. This version of the head has a Flip Lock quick release. The quick release uses all standard Arca-type compatible camera plates. If using multiple independent brand plates other than Arca, it is important that they all be of the same brand to avoid accidents due to inconsistencies in manufacture. Locking operation is facilitated by simply turning the highly visible knurled ring on the body of the head. It is easy to feather control between loose and firm lock. Situating the panning mechanism directly below the camera plate, instead of in the base of the head, means that the pan is always in the same plane as the camera. The aspheric shape of the ball gives progressive resistance to tipping and can prevent accidents. Box Dimensions (LxWxH) 6.4 x 6.3 x 3.9"
Monoball p0 Hybrid Ball Head with Flip Lock Quick Release is rated 3.3 out of 5 by 3. Rated 4 out of 5 by E.J. 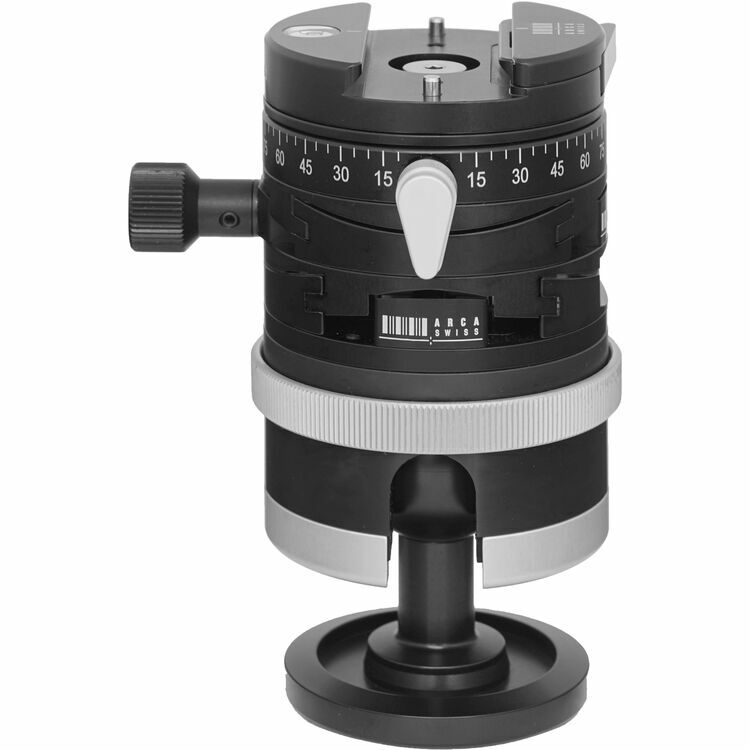 P. from Great head, complicated clamp The Arca-Swiss p0 is an excellent choice for people needing a precision geared head that also allows fast large adjustments with light to medium weight camera gear up do and including all 35mm DSLR and the lighter medium format systems. Gear action is very smooth and precise. Id there is a downside it is the overly complicated lever clamp that requires three seperate action just to open the clamp, two of which are nearly impossible with gloves. As such, I have replaced the lever clamp on top of the head with one from Really Right Stuff. Rated 4 out of 5 by Robert G from I like it but...... 2/3rds of this Hybrid Ball Head are perfect. The twist lock is phenomenal when balancing a heavy load like a Macro Rail kit/controller with camera and lens which perhaps weights in at 10-12 lbs. The pano is perfect and the reason for this type of design, (having the pano on top of the easy adjusters) makes leveling, a dream! But, the Flip Lock Quick Release is a very poor design, Arca-Swiss need to go back to the drawing board.? 1) The locking for the lever is poorly done, not easy to move when desired. 2) The locking lever does not have a large enough camber thus it only opens or closes a very small amount. For those of us that have Arca plates for many of our lenses and camera's, (as well as rail kits and so on), one has to ditch all the plates and get a single model for all items or do what I did, try and change the clamping width too many times and the whole apparatus sprung apart.? Do your self a favor, get the screw locking release, then this head deserves a full 5***** stars!! Rated 2 out of 5 by yuzhu from Almost my ideal tripod head It is almost the exact tripod head in my mind: light weight, quickly adjustable, precise for final adjustments. But.......The biggest defect is the level! So Arca Swiss doesn’t design this tripod for anyone need use L plate! No way you can see level after putting camera on! Then what is the point to design it to be precise if you can’t see the level? Returned it. Bought D4 instead. A little heavy, but does work what I need. Is there a way to adjust tension on the fine tune knobs? cube has this option, I have a lightweight mirrorless camera and don't need a lot of tension. Thanks in advance. Not that I know of, but it is not an issue. The knobs turn easily and stay put where you leave them. I am having a great time with my p0. Answered by: J C E.